Approve (or deny), modify, or delete events. Events created on the calendar site are listed here. Each event will display its name, series event type, Date/Time, and Status. If you have sufficent permissions, you can create, approve, deny, change or delete events. 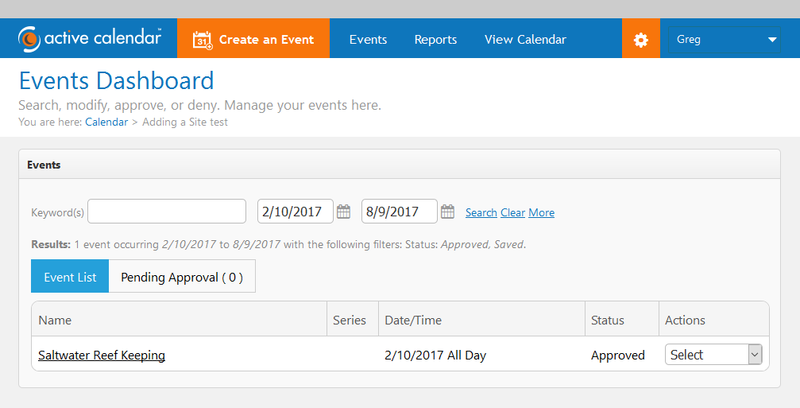 By default, all approved events and saved events occurring today and the next 30 days will be displayed. If your site administrator has modified the default display range in search settings, a different range of events may be displayed. Additional informaiton about the default display range can be found by visiting this page. Keywords, by entering one or more keywords that the event must contain. A range of event start dates. The default is today plus thirty days. Start Date of Search Range. End Date of Search Range. To filter on more than just keywords and event start date, click More. This allows you to search by additional criteria. Categories: Select an item from the drop down to filter by an event category. Locations: Select an item from the drop down to filter by an event location. To filter by one or more event status select the check-box to the left of the status name. By default the list includes the following two statuses Approved and Saved. Deleted: Events not approved or published, and not pending. You can sort the events shown in the list by name or status. Sorting the list will change the order in which the events are displayed in one of two ways. Ascending (A-Z) or Descending (Z-A). The list of events can be sorted by name A-Z or Z-A. To sort the event list by name, follow the steps below. Clicking the Name Column a third time will clear the sort of the list by name and return to the default display. The list of events can be sorted by event status A-Z or Z-A. To sort the event list by status, follow the steps below. Clicking the Status Column a third time will clear the sort of the list by status and return to the default display. Each event shown on this page has an Actions drop down menu on the far right side. Edit is the same as clicking on the event's name. If the event is a series, this option modifies only the single date and time or occurance of that series event. If you wish to edit all dates and times or occurrences of a series event click Edit Series. Edit series modifies all future occurrences in the series. Copy Create a new event based on this event's information. You will be redirected to the Create an Event page with the event's details already filled in. Cancel Changes the display of the event name to include the text, "Cancelled". An additonal Cancellation Dashboard is displayed when this option is selected. If you wish to edit all dates and times or occurrences of a series event click Delete Series. 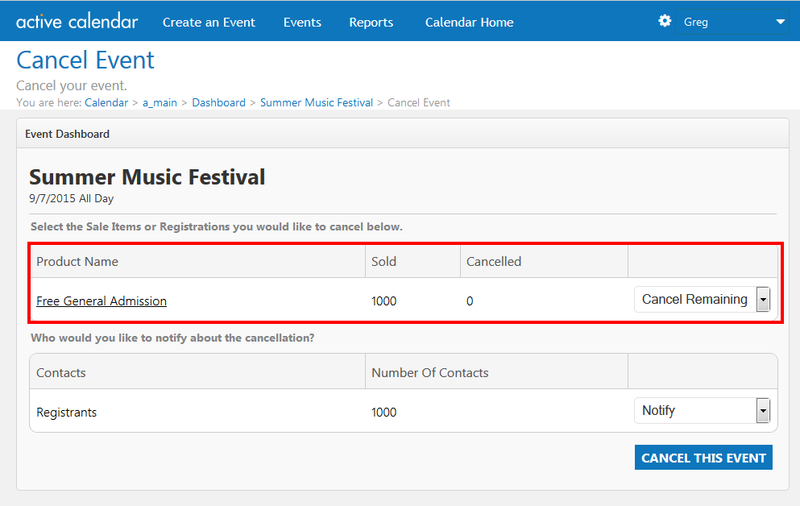 When a user selects to cancel an event the following Cancellation Dashboard will be displayed. To complete the cancellation of an event, click the "Cancel this Event" Button, and click "OK" in the confirmation pop-up. If the event being cancelled includes registration or sale items the following panel will be displayed. Two options will be available for each item in a Drop Down. Cancel Remaining: Selecting this option will automatically cancel and alert the registrant or purchaser for the product indicated. Please note: this will not automatically issue a refund. Refunds must be issued via the Events Dashboard. Click here for help on refunding. Do not Cancel: Selecting this option will retain all registrants as active for this event. It is recommended that if an event is cancelled to use the Cancel Remaining Option. If the event being cancelled includes subscriptions, notifications, or alerts (where a user has opted in to be notified of changes to the event) the following panel will be displayed. Two options will be available for each type of conact in a Drop Down. 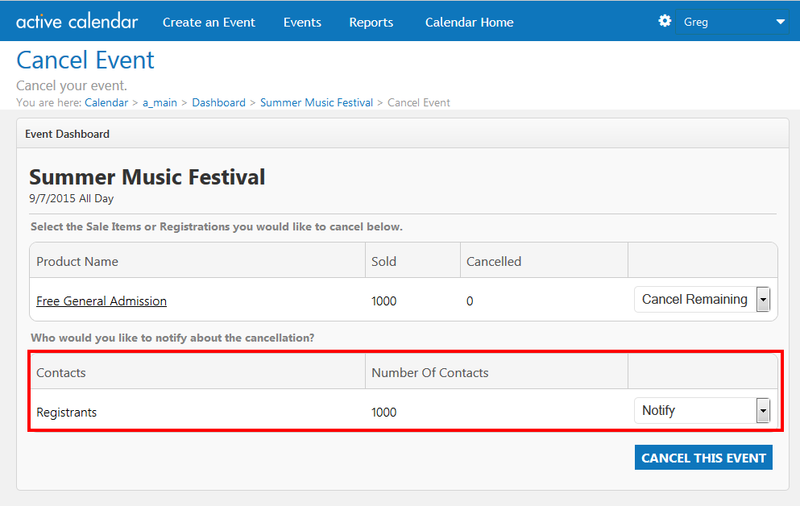 Notify: Selecting this option will automatically alert the contact via email that the event is cancelled. Do Not Notify: Selecting this option will not notify the contact of the cancellation of the event. They will not recieve an email informing them of the cancellation. Click on the event's name or select Edit from the drop down. (optional) Enter a comment under Version Control indicating what you changed, why you denied the event, etc. Click on the Series event Symbol to the right of the event's name. Or, Select, Edit Series from the Actions drop down. The Create an Event screen will be loaded with the event's details. Confirm your request in the pop-up. To change an event from a deleted status use the "restore" feature. Please note: restoring an event will change its status to saved. To permanently remove an event with a deleted status use the "purge" feature. Please note, purged events cannot be recovered. This area lists events awaiting approval, and changes to unapproved events. To view the submited event for approval, click the Review link in the actions column. 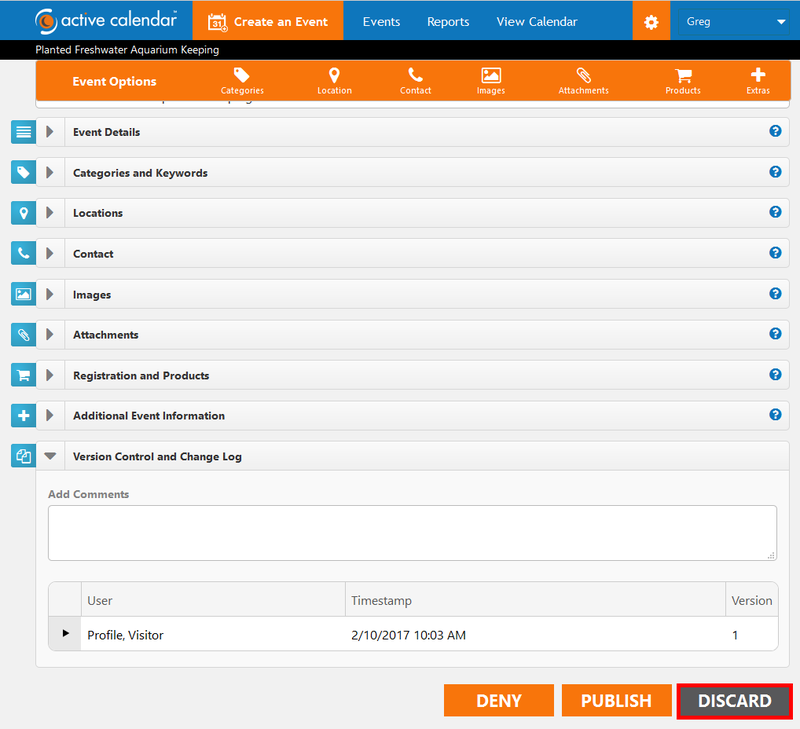 Event Publisher uses a centralized workflow, meaning events are submitted to a single calendar site. The event will be reviewed for approval by the site administrator, or users with the "Site Event Approver" permission. When reviewing an event submitted for approval and publishing to the calendar. The create / modify event screen is displayed, with the details of the event populated. 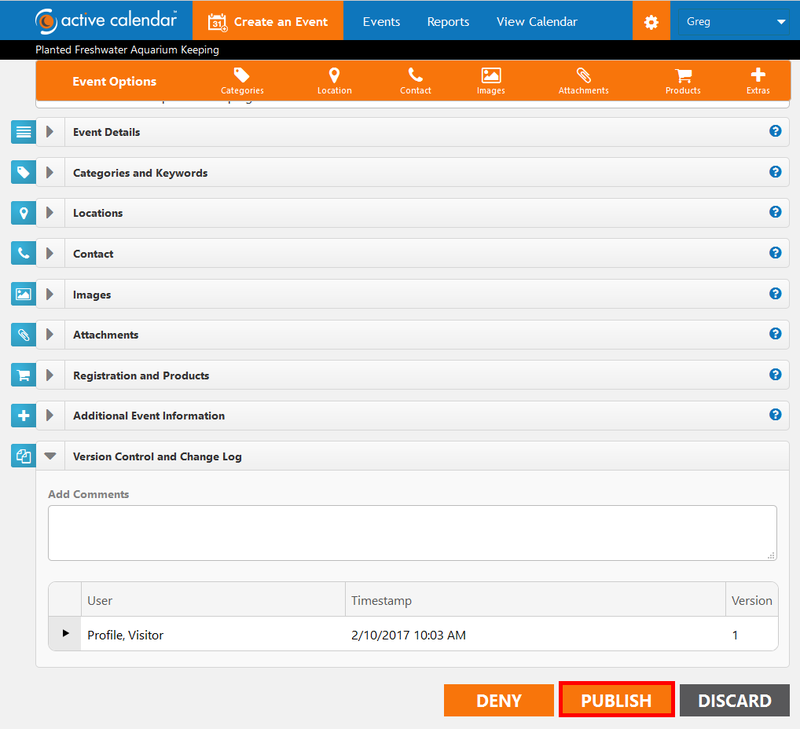 If the event meets your criteria, select the publish button to add the event to calendar. Once published it will be visible to all calendar site visitors on the calendar front end (grid view, list view, summary view, and location view). If the event does not meet your criteria, select the deny button. This will prevent the event from being displayed to calendar visitors on the calendar front end (grid view, list view, summary view, and location view). When the deny button is pressed, a pop over is displayed, offering you the opportunity to send a message to the event author. This message will be included in an email to the event author informing them that theyr event has been denied. They have the opportunity to edit the event, and resubmit it for approval. Use this button to return to the event dashboard without publishing or denying the event. The event will remain in the pending event list. 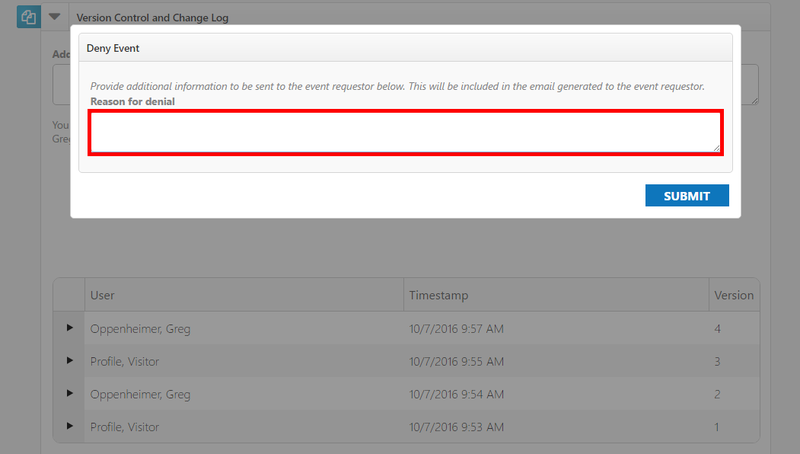 This area lists events awaiting to be displayed on your calendar that meet the site aggregation configuration. 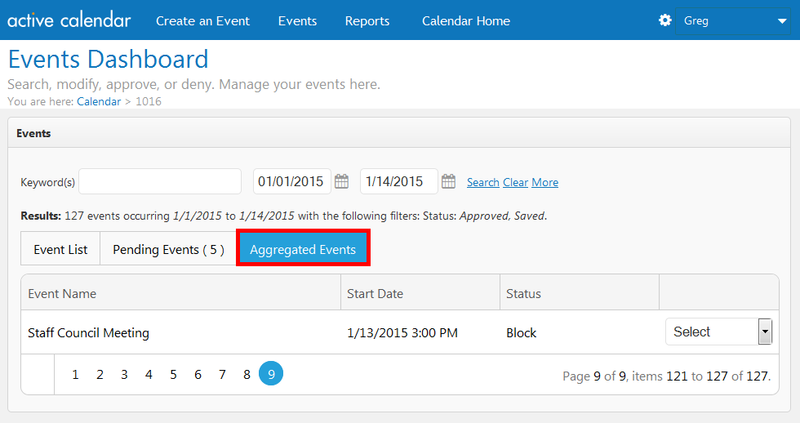 Clicking on the name of the event will allow you to view the aggregated event's details page. Allow to display the event on the site. Deny to remove the event from display on the site.